Meet Butch: believer that Necessity is the Mother of Invention and owner of Wooden Spoon, a restaurant supply store, in Melbourne, FL. 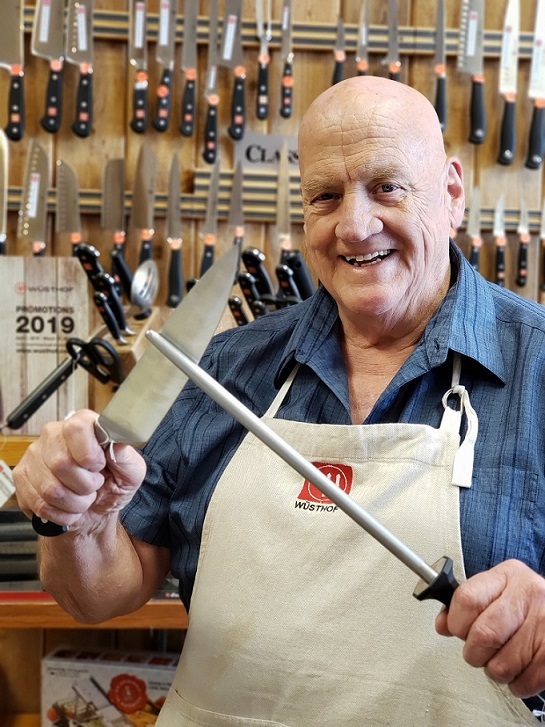 With 26 years of experience, Butch has been specially trained in sharpening all types of knives and scissors particularly hair shears. Since 1991, weve been offering our customers the best in unique kitchen items. Whether youre looking for cookware, kitchen dcor, or gourmet kitchen spices, our store stocks it all. We take great pride in our outstanding customer service and reasonable prices on all of our specialty gadgets and other kitchen supplies. When you find yourself in need of Estate Wine Openers or specially designed nightlights that use scented oils or candles as deodorizers, come into Wooden Spoon located in Melbourne, FL. We also encourage and welcome everyone to join our over 10,000 email subscribers to our newsletter, which is published quarterly. Dont worry about spam or being bombarded with emails, because we strive to only send our subscribers the best content ranging from sale info, special notices, and delicious recipes.